The following document was published by the U.S. Navy in August 2015. 1. PREAMBLE. The June 2013, Chief of Naval Operations and Commandant of the United States Coast Guard’s joint policy statement, The National Fleet: A Joint United States Navy and United States Coast Guard, referred to hereafter as the “National Fleet Policy,” directs the Navy and Coast Guard to achieve commonality and interoperability for 21st century maritime and naval operations. This commonality and interoperability is intended to ensure effective and efficient operations when Navy and Coast Guard forces mutually support each other. 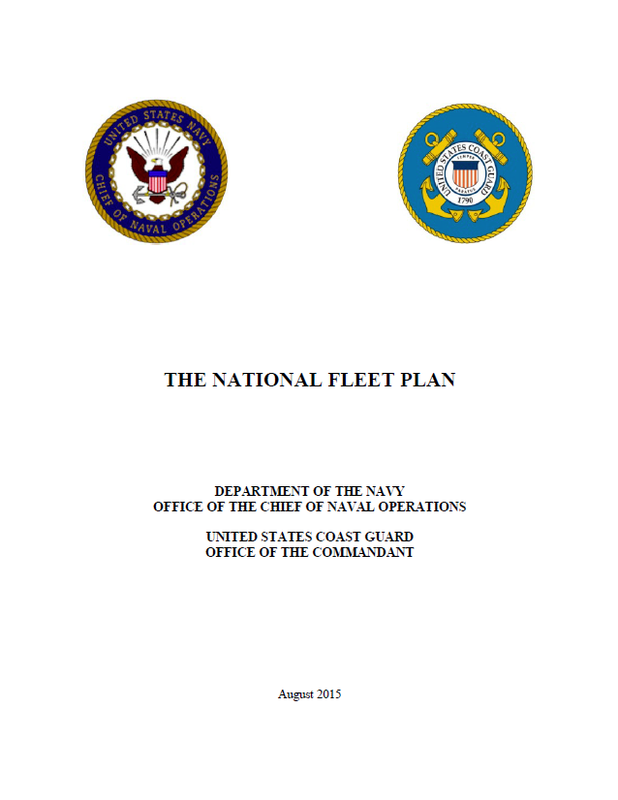 In response to, and as directed by the National Fleet Policy, this National Fleet Plan, hereafter, “The Plan,” provides the detailed action and milestones both services will implement to reach those objectives. 2. PURPOSE. Given the complexity and lethality of national security threats in the maritime domain, and in support of the U.S. National Strategy for Maritime Security, and the Sea Services’ (Navy, Marine Corps, and Coast Guard) joint maritime strategy, A Cooperative Strategy for 21st Century Sea Power, it is vital to America’s interests that the Navy and Coast Guard collaboratively plan, field, and sustain interoperable and affordable forces to provide complementary support for each other’s mission sets. As good stewards of the Nation’s resources and faced with an uncertain budget environment, it is imperative that our services cooperate in a deliberate manner. Implementation of the National Fleet Policy will provide the Nation with more interoperable and fiscally efficient Navy and Coast Guard forces. The National Fleet Plan identifies specific Navy and Coast Guard authorities, methods, and measurements to avoid redundancies and achieve economies of scale. It improves operational effectiveness and provides a mechanism to enhance integration and resource development. The Plan is adaptive to meet emerging national security threats and scalable to address changing service challenges. 3. NATIONAL FLEET PLAN OVERVIEW. The National Fleet Policy and Charter of the National Fleet Board directed the establishment of a Flag-Level Board consisting of Navy and Coast Guard officers from the staffs of the Office of the Chief of Naval Operations (OPNAV) and Coast Guard Headquarters. The Board is co-chaired by the OPNAV Director, Strategy and Policy Division (OPNAV N51) and the Coast Guard’s Assistant Commandant for Response Policy (CG-5R), reporting to both the OPNAV Deputy Chief of Naval Operations for Operations, Plans, and Strategy (OPNAV N3/N5) and the Deputy Commandant for Operations (CG-DCO) . a. Identify potential opportunities to increase commonality and interoperability of the National Fleet. Specifically focus on platforms, equipment, weapons and weapons systems, material, supplies, facilities, maintenance, and supporting services. Additionally, determine and identify the equipment and material to be procured or developed, training and certifications required to prepare for missions and integrated operations, and the operation of our supply/logistics systems. b. Examine Navy and Coast Guard logistics processes and integration initiatives, research and development, acquisitions, information and intelligence systems integration, force planning, resourcing, procurement, doctrine development, training, exercises, and operational planning processes to further develop mutually supporting forces. c. Validate Navy and Coast Guard specific and non-redundant warfighting capability requirements to ensure both services are poised to meet current and emerging threats to national security, during times of peace and war, through deliberate design and acquisition processes. d. Translate strategic direction into actionable lines of effort and milestones over the next ten years. Throughout the Plan, the term “Current State” will be used to provide a description of ongoing interoperability efforts and to identify planned initiatives occurring during the next five years. “Future State” will be used to identify planned initiatives over the next ten years. 4. PLAN PROGRESSION AND OVERSIGHT. As directed by its Charter, the National Fleet Board will provide review and oversight of the Plan’s implementation and progress. The Board Co-Chairs will receive periodic updates from the leads of the Commonality Working Groups and report the status of the Plan and its progress to the Chief of Naval Operations and the Commandant of the Coast Guard at the annual Navy-Coast Guard Staff Talks. 5.1 CURRENT AND EVOLVING OPERATIONS. a. INTRODUCTION. Current operations and associated service-level planning efforts focus on processes, policy, and mutually beneficial relationships to ensure mission success. Continuous innovation and adaptation by the Navy and Coast Guard inform a forward-looking effort to describe ways to enhance our joint capabilities and address emerging threats. Our globally-distributed, mission-tailored forces contribute to homeland defense in depth and provide the basis for a secure maritime environment. As our interoperable forces continue to coalesce, we bring a robust blend of “hard” and “soft” power and a range of military options in support of national objectives and enduring national interests. The synergy generated from our ability to plan collaboratively and our proven experience operating together yield great benefits for security, stability, and crisis response. The Navy and Coast Guard are uniquely postured to conduct cooperative international engagement in the maritime domain while building broad partnerships across a range of mission areas. Navy and Coast Guard forces maintain a symbiotic relationship that benefits the nation as a whole. This relationship is most noticeable during ongoing operations, but it starts with conceptualization, continues through the planning cycle, and culminates during mission execution. In the near-term, Navy and Coast Guard will prioritize the actionable initiatives below to improve commonality and interoperability. b. CURRENT STATE (Next Five Years). 1) Improve Arctic capabilities. The opening of the Arctic will present the Navy and Coast Guard team with new challenges to ensure freedom of navigation, support search and rescue efforts, and maintain maritime security. The National Strategy for the Arctic Region, along with the DoD Arctic Strategy, the United States Coast Guard Arctic Strategy and the U.S. Navy Arctic Roadmap 2014-2030, describe how we will approach these challenges and opportunities by advancing our security interests, pursuing responsible Arctic stewardship, and strengthening international cooperation. The Navy and Coast Guard will continue to have a role maintaining safety and security in the harsh environment as changing ice conditions enable economic opportunities and with that, some level of increased human activity. Mutually supporting relationships will be essential for carrying out distinct service mission sets that require specialized equipment, training, logistics, and a heightened level of interoperability. Enduring reviews of requirements and capabilities, coupled with a shared understanding of roles, will enable the services to shape programs and operations. 2) Continue to employ and refine adaptive force packaging. Adaptive force packaging provides commanders with flexible scalable resources that bring additional capabilities and authorities to meet mission specific objectives. Beyond innovatively integrating ships or aircraft into task forces, adaptive force packaging incorporates transferable crew and equipment modules to meet demands and enhance effectiveness. It directly supports the Sea Services’ goal of globally distributed-mission tailored maritime forces. Navy and Coast Guard forces routinely deploy together to conduct Counter-Illicit Trafficking (CIT) operations, counter-piracy missions, Counter-Weapons of Mass Destruction (WMD) operations, Maritime Interception Operations (MIO), Antiterrorism (AT), and Theater Security Cooperation (TSC) missions around the globe. Visit, Board, Search, and Seizure (VBSS) teams and integrated units must continuously refine tactics, techniques, and procedures in order to meet evolving threats. To effectively provide tailored capabilities and authorities, joint USN/USCG forces must fully comprehend the skills and limitations available, and understand the common terminology and tactics, techniques, and procedures to be used during operations, to include those of partner nations. 3) Advance National efforts to enhance Maritime Domain Awareness (MDA). In December 2013, the National Security Staff released the National Maritime Domain Awareness Plan (NMDAP) to provide a National focus on MDA in support of homeland defense. A supporting plan for the U.S. National Strategy for Maritime Security, the NMDAP promotes global maritime security through improved understanding of the full spectrum of activity in the maritime domain. It promotes favorable conditions for information sharing and synthesis, including intelligence information, to better inform decisions affecting the security, safety, economy, and environment of the maritime commons. Navy and Coast Guard will address the MDA challenges identified in the NMDAP by improving information sharing, emphasizing the use of common data standards and collaborative information environments, and fostering partnerships with international and interagency partners. 4) Integrate Homeland Defense / Homeland Security mission sets. Navy and Coast Guard units and operations centers within the United States must continue to support information sharing, collaborative planning, and coordination of operations. Shared situational awareness through common (user-defined) maritime pictures across Combatant Command, Navy and Coast Guard Operations/Fusion Centers is an essential component of operational decision making and integrated maritime operations. We must be able to efficiently sustain operations such as high value unit (HVU) protection and seamlessly transition to on-demand response operations to counter threats to the homeland. Interoperable units, such as Coast Guard Maritime Force Protection Units charged with protecting ballistic missile submarines, provide an excellent example of integration including shared platforms, doctrine, and planning. 5) Share Liaison Officers (LNOs). The Navy and Coast Guard share LNOs at all echelon staff levels to facilitate matters of mutual interest. LNOs between the naval services act as valuable communication nodes and serve as conduits for articulating service priorities in addition to duties that directly influence planning and operations.